This article was written by Will Nasgovitz – Portfolio Manager. One of the unintended consequences of the Fed’s easy money policy over the past nine years has been a real-world lesson on the law of diminishing returns. 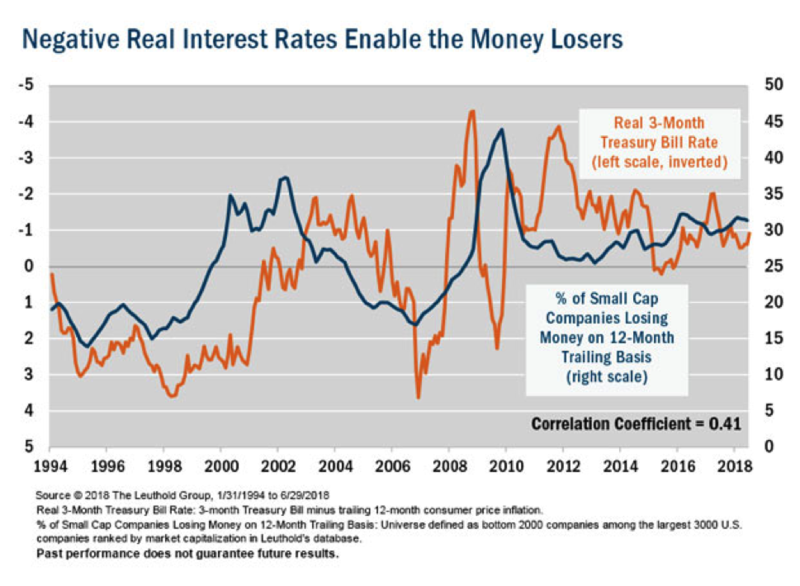 As the chart below shows, the drop in real rates on the three-month Treasury has coincided with a rise in the percentage of money-losing companies among small caps. The relationship seems counterintuitive—lower borrowing costs should provide a break to cash-strapped businesses. Instead, many CEOs have viewed lower rates as a green light to borrow more in pursuit of speculative projects, and many have not panned out. With the 10-year Treasury nudging back above 3% recently, and the London Interbank Offer Rate (LIBOR), which is used to set rates for many commercial loans, jumping more than 100 basis points in the past year, it appears the days of cheap money are winding down. As borrowing costs escalate, some money-losing businesses will no longer be able to subsidize their weak results and will face a day of reckoning as they are forced to pay for underperforming ventures. We have always viewed strong balance sheets as an important factor when making investment decisions. With corporate debt near a historic peak relative to gross domestic product, we believe this emphasis will prove critical in the coming months. Past performance does not guarantee future results. Investing involves risk, including the potential loss of principal. There is no guarantee that a particular investment strategy will be successful. Value investments are subject to the risk that their intrinsic value may not be recognized by the broad market. The statements and opinions expressed in this article are those of the presenter. Any discussion of investments and investment strategies represents the presenter’s views as of the date created and are subject to change without notice. The opinions expressed are for general information only and are not intended to provide specific advice or recommendations for any individual. Any forecasts may not prove to be true. Economic predictions are based on estimates and are subject to change. Small-cap investment strategies, which emphasize the significant growth potential of small companies, have their own unique risks and potential for rewards and may not be suitable for all investors. Small-cap securities are generally more volatile and less liquid than those of larger companies.